Leave it to me. 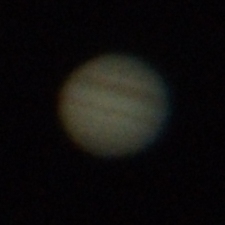 -15C, winds up to 80kmh, and i'm outside with my telescope for 8 hours. Have to admit, though, it was a great night for visibility. Out of the 146 pictures I took, these are the best. 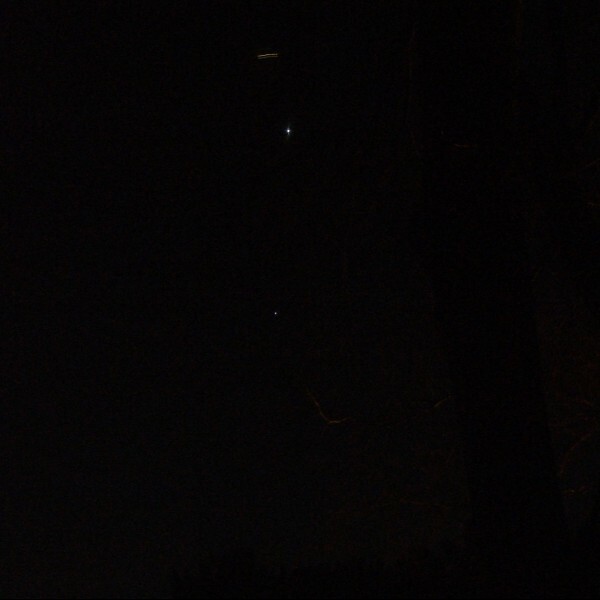 January 28, 2012 9:11 P.M.
Two shots of Jupiter. They're getting better... The little "blob" on the bottom-left side of the planet is one of Jupiter's moons, Ganymede, heading around the back of the planet. 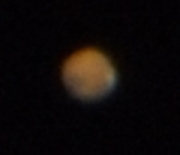 January 29, 2012 2:39 A.M., 2:40 A.M., 3:18 A.M.
Three shots of Mars. The white marking on the right side is the polar ice cap. 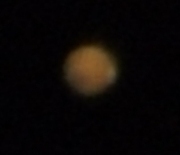 I wish the camera could pick up exactly what I saw; it's easy to see why people used to think there were canals on Mars. January 29, 2012 3:19 A.M.
And finally, two fairly lousy shots of Saturn. I found it one minute after my last picture of Mars, just as the clouds started pouring in from the west. These were all I got of it, but it gives me something to look forward to the next clear night! 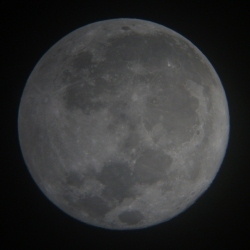 February 7, 2012 10:30 P.M.
Nice full moon this week. Time to try my settings... Took the first picture with the camera's AUTO feature, as in it takes the best picture it thinks it can. Uh-huh. The next picture was taken with my settings, ISO 100, -2 exposure, white balance set to fluorescent. I see the difference; do you see the difference? I know what settings i'm using from now on... Click on the pictures for a larger image. 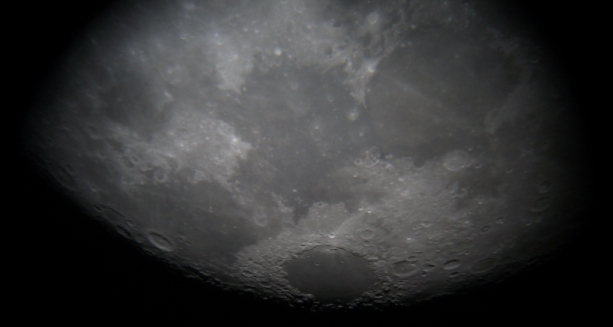 February 7, 2012 10:57 P.M.
A few close-ups with the afore mentioned settings... The picture on the left shows Mare Serenitatis (Sea of Serenity)at the top, and Mare Tranquilitatis (Sea of Tranquillity), just below. 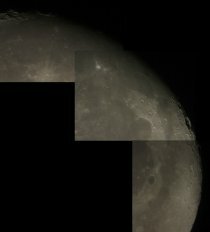 The pic on the right shows Kepler crater at the top, with Copernicus crater just below. Click on the pictures for a larger image. February 7 & 8, 2012 11:22 P.M., 12:20 A.M. Thought i'd try setting the white balance to the "incandescent" setting, then to "fine". 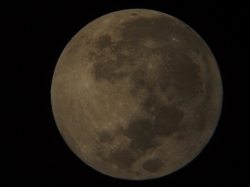 Neat "Blue Moon" effect on the first shot, and just a bit too bright on the second. Fun to play, though! Click on the pictures for a larger image. 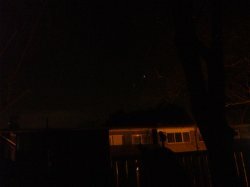 Another really clear night. 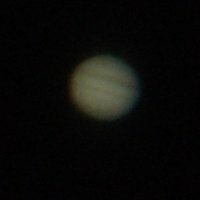 Even though there was a full moon (which makes for a rather bright night-time sky), I managed to photograph five planets and, of course, the moon. February 8, 2012 7:22 P.M., 7:23 P.M. 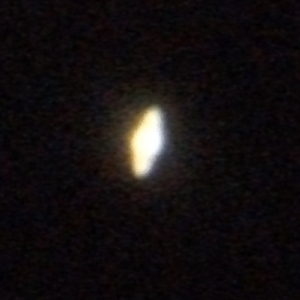 The first shot is Venus, with a little bluish-green dot to the below-right. That might be the planet Uranus. According to my sky chart program (Stellarium), it's in the right place. Not 100% sure that's it, though. 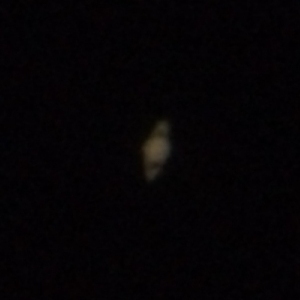 The second pic is Venus; that's also probably the best shot i'll get of it, too. 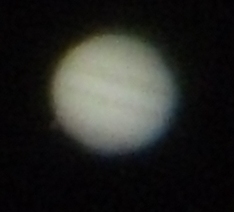 February 8, 2012 9:49 P.M.
Two very good (I think) pics of Jupiter. The pic on the left has a black dot just to the right of the top center. That's the shadow of Jupiter's moon, Io, just starting to transit across the planet. The picture doesn't do justice to what I saw; too cool. 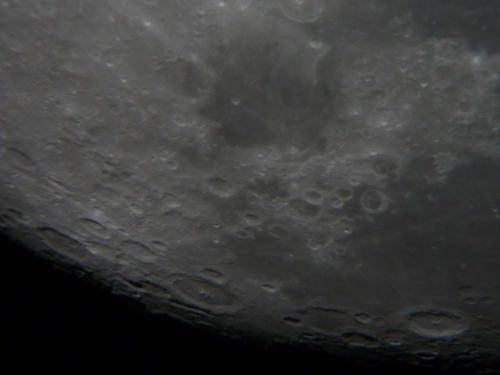 Two close-ups of the moon. Amazing through a good scope. Click on the pictures for a larger image. 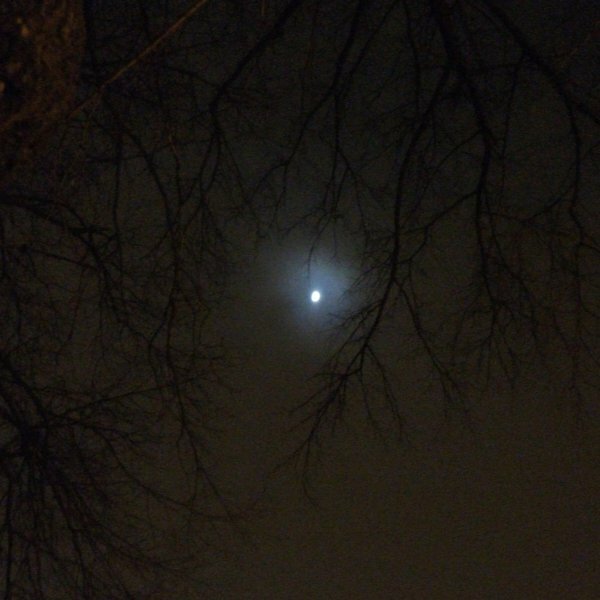 February 8, 2012 11:50 P.M. 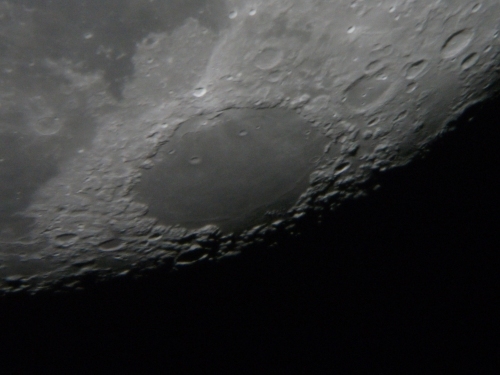 This is a 55-second movie I made with my camera of the moon floating by the lens of my telescope. On the higher magnification lens it goes by even faster. Not overly steady; I might try to make a mount for the camera. 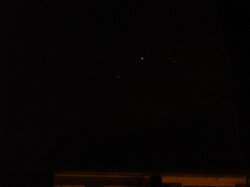 Click here for Flash video (opens in new window). Click here for Windows Media (opens in Media Player or whatever you have...). February 9, 2012 12:23 A.M., 1:28 A.M. 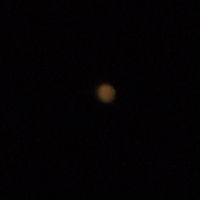 Here's Mars. 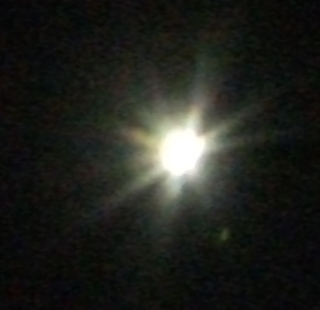 Considering its close proximity to the very bright and full moon, i'm surprised they came out. February 9, 2012 1:29 A.M. 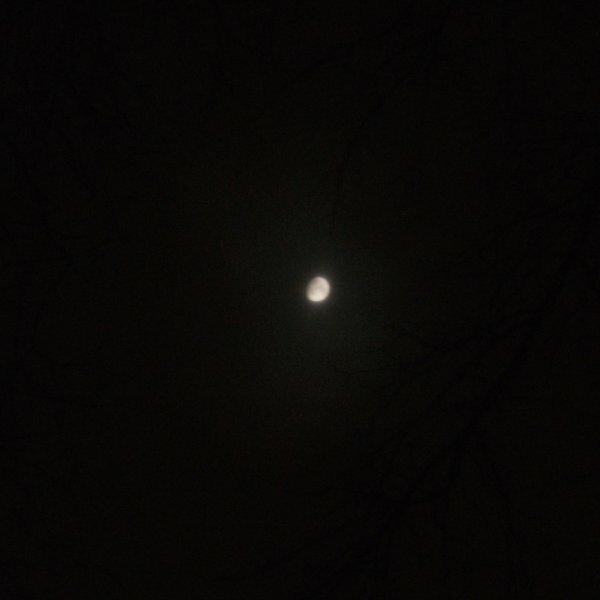 The moon again. Wow. Click on the picture for a larger image. February 9, 2012 3:16 A.M. Finally Saturn's up; i'm getting a bit pooped... Well worth the wait, though. 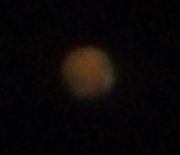 I could see it's largest moon, Titan, but the camera wouldn't co-operate. Oh, well. You can see why this planet is one of the first that new telescope owners try to find. While sorting through all the photo's I took last night, I made a background of some of the better shots I took. Wow, I probably really need a life, lolol... Click on the image to open a new window. The image size is 1920 X 1280, and it's in JPG format. March 4, 2012 11:37 P.M. 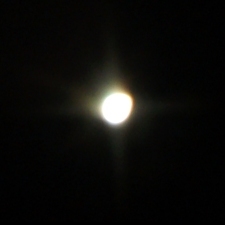 It's been a month of cloudy nighttime weather, so I thought I'd try to take a pic of the moon with no telescope. 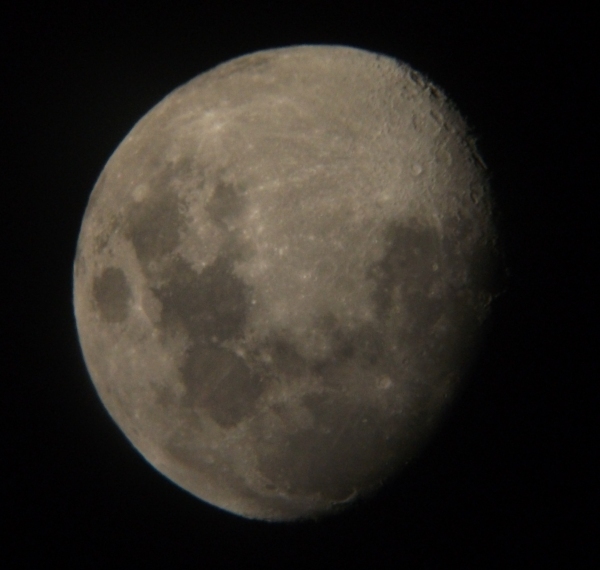 It was a rather hazy night, so I set the camera to ISO 800. The first picture is at regular focus, and the second is at full zoom. Not too bad for a cheap digital. And the tree was great to lean against for support when I took the shots. March 5, 2012 7:38 P.M. I guess my complaints last night were heard; the weather tonight was great. Jupiter & Venus are getting closer to conjunction (March 13), here they are below. March 5, 2012 10:52 P.M. Here's two pictures I made from five. Not perfect or even good by far, but it does give me a few ideas... ;-). 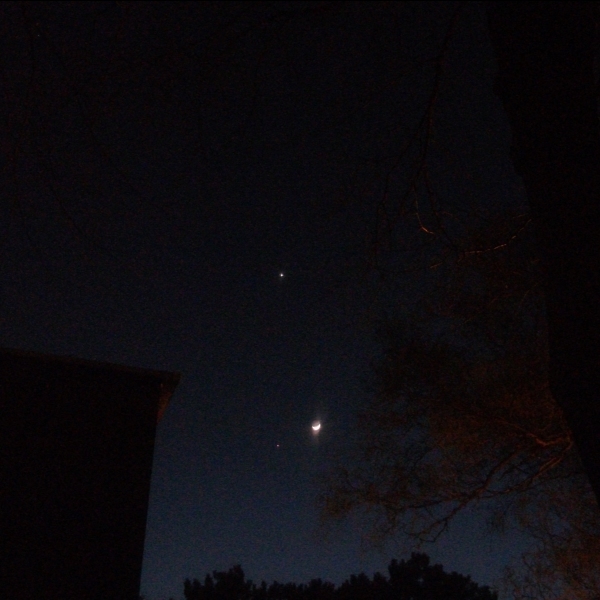 March 14, 2012 9:13 P.M.
OK, so I missed the closest conjunction of Jupiter and Venus by a day. Not much of a difference in view, and I was busy last night. I tried a few shots through the telescope, but the atmosphere wasn't co-operating. 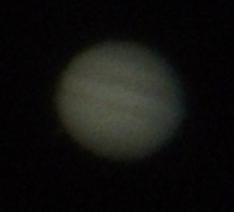 That happens, though I have to say Venus was phenomenal through my scope just to look at. I spend more time looking than taking pictures. 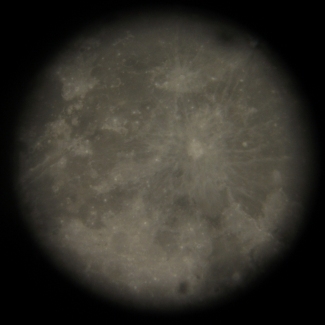 So I thought I'd try it without the scope, with much the same camera settings as my moon shots on the 4th. 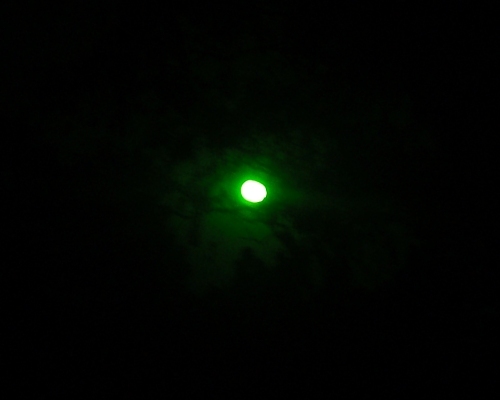 The first is regular focus; you can see my scope between the tree and shed. The second is 2X zoom, and the third is at 4X. I was quite happy with the results, actually. 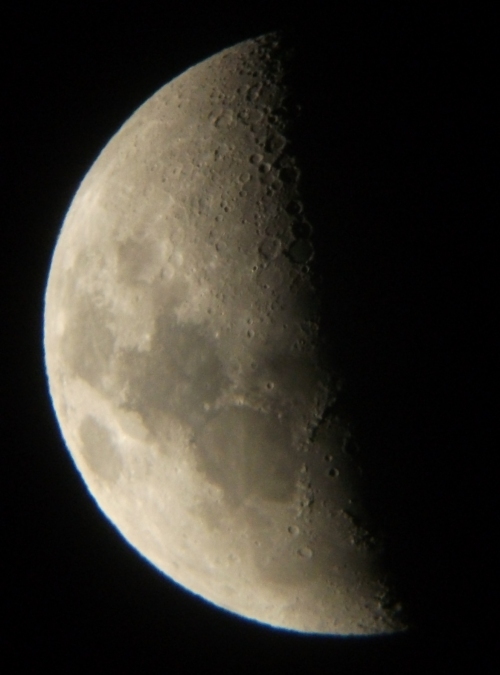 March 21, 2012 9:00 P.M.
Nice night out tonight.  All the plants in the garden are starting to come up, and Jupiter and Venus are drifting farther apart, as you can see in the photo below. That's Jupiter at the bottom, Venus at the top, and that streak just above Venus is a passing airplane. 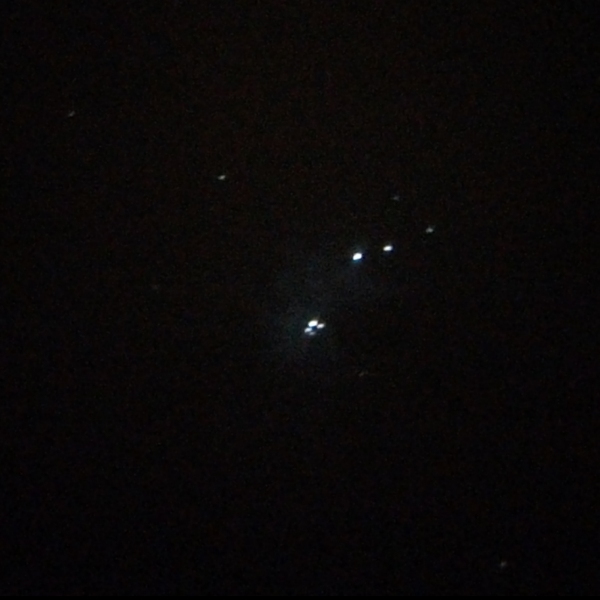 March 21, 2012 9:56 P.M.
OK, I didn't think a non-SLR camera could do this, but I managed to get a somewhat blurred image of the Orion Nebula. I set the ISO to 800 and the exposure compensation to +2. The stars are blurred, too bad. The white haze surrounding the four stars in the centre is a hydrogen cloud. I have GOT to get to some non light-polluted skies...! March 25, 2012 9:00 P.M. 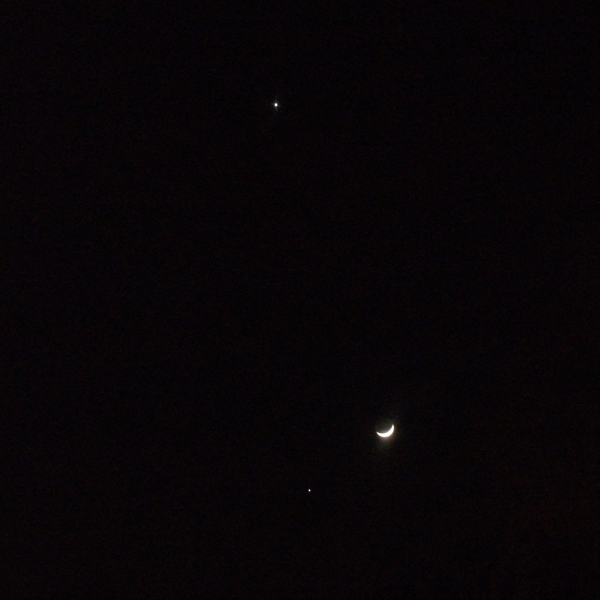 The weather is sooo nice... And a great view of the Moon, Jupiter and Venus. 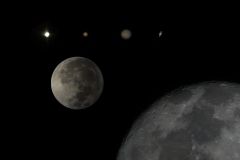 Five days before the moon's first quarter; quite the sight. 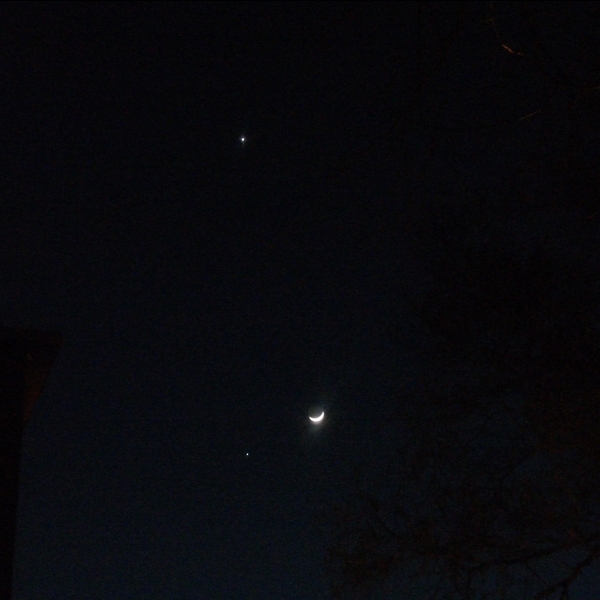 Jupiter's at the bottom, moon's to the right with Venus up above. Here's two shots, the bottom one is on zoom. March 25, 2012 9:22 P.M.
Another shot, this time the sky is a bit darker. Wow, two months ago it was dark at 7:00... Not anymore! April 9, 2012 1:38 A.M.
Would be nice if Mother Nature could make up her mind... 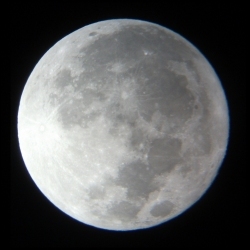 This is the first clear night in a while, although the humidity is way up there. 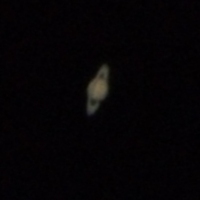 Got some good views of Mars and Saturn, and this was the only picture I took. April 28, 2012 7:38 P.M.
May 5, 2012 11:38 P.M. 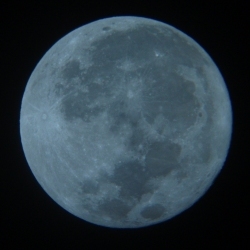 So tonight is a full moon and the "Supermoon" of 2012, meaning it's at it's closest point to Earth. 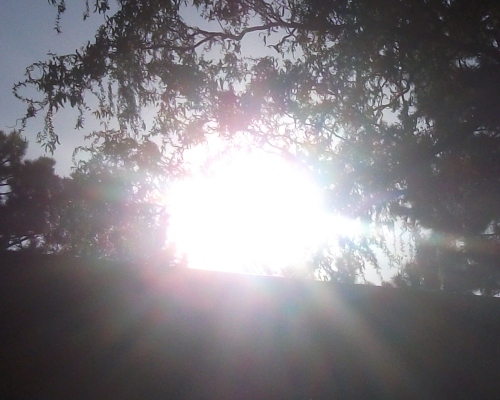 It was bright alright, but not nnoticeablybigger. Here's a pretty good shot. May 5, 2012 9:56 P.M. This shot of Saturn I took a little earlier on in the night, before the nice bright moon was too high up. 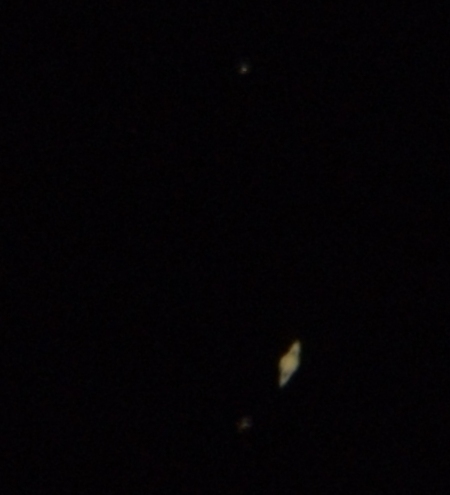 I could see four of Saturn's moons, but the only ones that were bright enough to come out were Titan (top) and Rhea (below). May 11, 2012 10:52 P.M. Here's three shots of Saturn I took, one right after the other. Amazing how all three look slightly different; you never know what you'll get. That's what makes it fun...! May 19, 2012 11:38 P.M. Tomorrow there is going to be a solar eclipse(partial for me), so I thought I'd try to take a pic of the sun without and with a #14 welders lens. Should work; the camera wasn't even on a tripod. 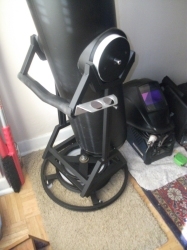 I'm going to try it in front of my telescope, too. May 19, 2012 10:52 P.M. 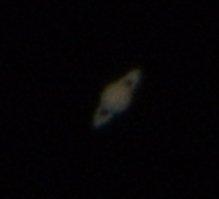 Here's 5 shots of Saturn I took at the exact same time I did earlier on the 11th of this month; it wasn't intentional. I only noticed it when I was putting these up. Anyways, these are all taken one after the other in a 9 second time frame. Great night for viewing. It turns out that the solar eclipse I mentioned yesterday is a)just before sunset and b)too close to the horizon from where I am. Next time! And so begins the hot, humid & hazy nights of summer in Toronto. 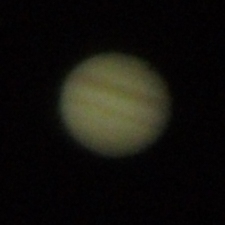 Haven't been out much with my telescope, too humid. Yup, this month is pretty much a repeat of June, weather-wise, and i'm still building my new base. We've been following it since its launch last November, and we're all looking forward to it! Finally, the big night we've all been waiting for here. My daughter's excitement has really been building up over the last two weeks; good for her. At 7 years old, it's nice to see her have an interest in this. I've been following a few NASA websites on all this, they have some really awesome stuff. The one that I like best is Eyes on the Solar System, which gives computer-simulated views from various spacecraft and places. I have spent hours at this site. 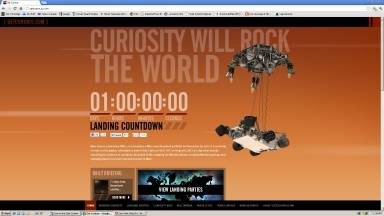 Another one is GetCurious.com, this being mostly a timer for the landing of the Rover (now it states how long it's been there). We also tuned in to NASA TV over the web, it was just like being there. Congratulation to the people at NASA for A)getting the Rover there in one piece and B) all the phenomenal coverage. Nice to see something be such a huge success with them; it certainly got a lot of positive media attention. Let's hope all the budget-makers saw it in a positive light, too. 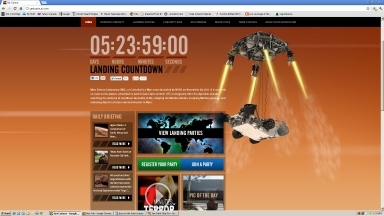 I took a few screenshots of both sites; I hope this is O.K. 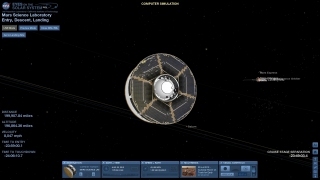 with NASA. It's more for the good memories of our "Mars Party". You can click on the pics for a larger image; they all open at 1600 X 900 in size, except for the last one in the Eyes on the Solar System pics, for some reason it's at 1024 X 768. 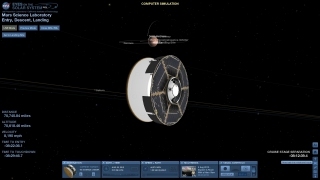 These are images from Eyes on the Solar System. Again, a big congratulations to all who were involved. 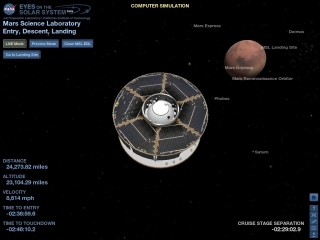 BTW, what do Nasa's web sites and this one have in common? They're both written in the Cold Fusion Markup Language (.CFM extension). Cool!! 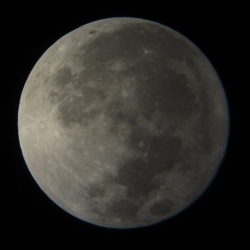 Sept 12, 2012 3:41 A.M.
After a month or so of really humid weather, it's finally starting to clear up at night. I got up early (thank you, bladder), couldn't get back to sleep, so I thought i'd take the scope out when I saw how clear it was. Glad I did, saw a lot till the sun decided to start brightening the sky. 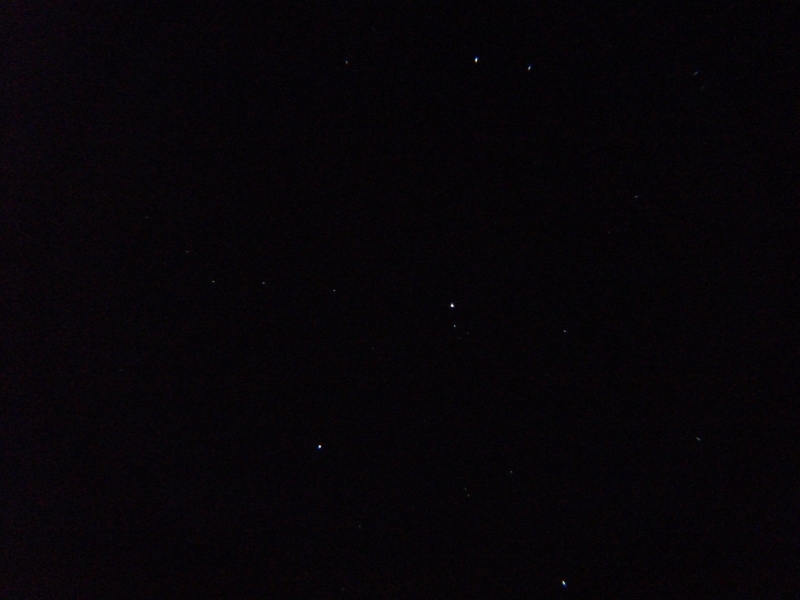 I only took one picture; it's of the Pleiades (M45). A few stars came out in the picture, but compared to what I saw with my eyes through the scope, there's just no comparison. Absolutely stunning. 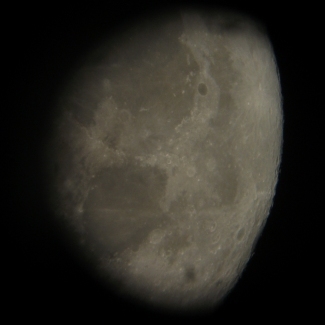 Oct 21, 2012 10:56 P.M.
Wow, what a great night for owning a telescope. Best night for visibility since last spring. I also tried out my new base for the first time tonight! I'm quite happy with it, I just have to make some feet for the bottom. Couldn't stay up as late as I wanted, too bad. 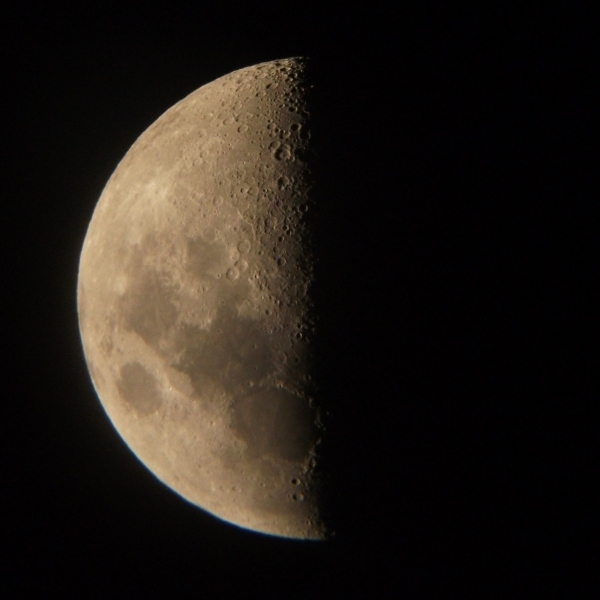 Got a great shot of the half moon (first quarter). Oct 26, 2012 3:02 A.M.
Another clear night, but the atmosphere was a bit hazy. I could see a huge difference from the other night. 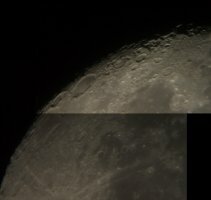 I took a few shots of the moon, and this was the best of the lot. Big difference from the 21st. Too bad, because I could see the constellation Orion. 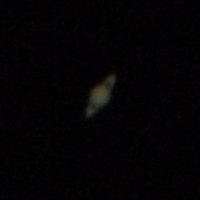 Looked good, picked out the nebulae, but it's been a better view other nights. Finally took some pictures of the base I made. It turns on four skateboard wheel bearings rolling on a plastic cutting board. 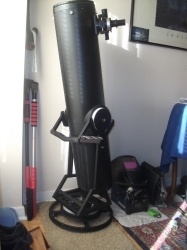 The base is made of 3 bicycle rims (12, 14, and 20 inch), and the frame is square tubing. Much lighter than the wood one, and a little easier to fit in the car. I still have the original base, no harm in keeping it. Nov 21, 2012 7:02 P.M. 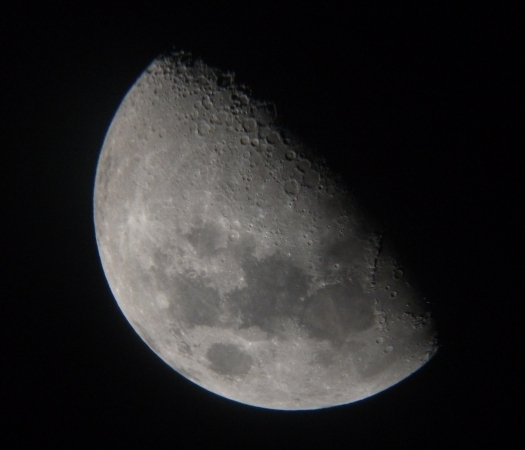 Here's a decent shot of the moon one day past first quarter. It hasn't been a good month for viewing, too humid out. Hopefully December is better...! Well, this has to be the worst December for weather at night I've seen in years. I haven't been out once. Well, January's coming up, a new year, so let's hope for the best. Merry Christmas, all!! !